Sabato's Crystal Ball has updated rankings on eight of this year's 34 Senate elections. All toss-ups, except for Nevada, have been characterized as leaning for one party or the other. Florida and Ohio move toward the Republican incumbents, with Indiana, New Hampshire and Pennsylvania now leaning Democratic. Those last three seats are also currently held by Republicans. The Illinois and Wisconsin races, two of the most at-risk Republican-held seats this cycle, were moved to Likely Democratic. With these changes, and a review of the overall race, the Sabato team now sees Democrats as "slight favorites to win a slim Senate majority" as we head into Labor Day. 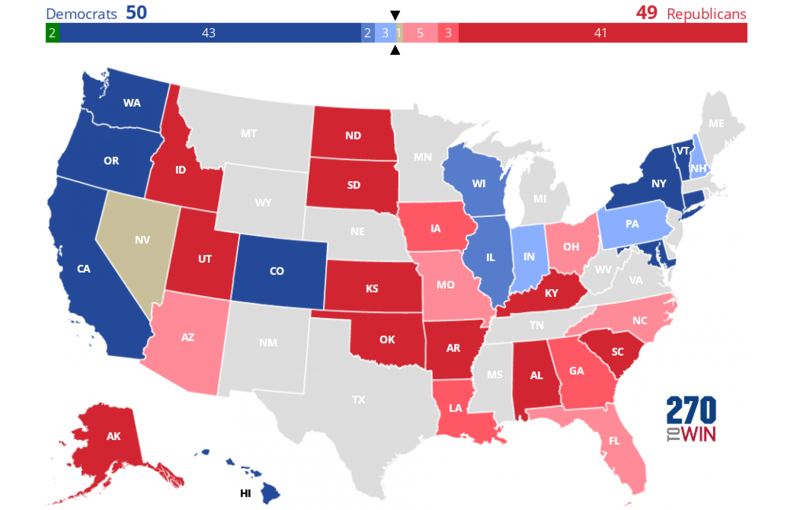 An interactive version of the current Sabato Senate map after these updates is below. Use it to create and share your own 2016 Senate prediction. You may have noticed that all the seats discussed above are currently held by Republicans. In fact 24 of the 34 seats up this year are held by the GOP, including 10 of the 11 races seen as at least somewhat competitive. The only Democratic seat that has a real shot at flipping this year is Nevada, where Harry Reid is retiring. This means the GOP is playing a lot of defense to hold control of the Senate. Democrats need to gain 4 or 5 seats* to take the majority. It is worth noting that 2018 sees a reversal, where Democrats are forced to defend 25 of the 33 seats up that year. It is quite possible that we may be in a period where control of the Senate flips between the two parties much more frequently than in the past. Visit our Senate Race Ratings & Polls page to see ratings and recent changes from several pundits and links to the Senate polls in each state. * A gain of 4 seats would tie the Senate at 50-50. Since the president of the Senate (the Vice-President) breaks any ties, control of a 50-50 Senate would go to the party that controls the White House.